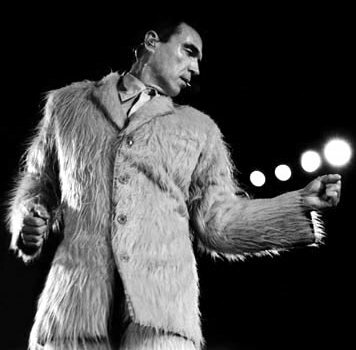 WAIST HIGH: Happy Birthday David Byrne. Born May 14, 1952, in Dumbarton, Scotland, Byrne was raised in Baltimore, MD. The son of an electronics engineer, he played guitar in a series of teenage bands before attending the prestigious Rhode Island School of Design, where, feeling alienated from the largely upper-class student population, he dropped out after one year. However, he remained in the Providence area, performing solo on a ukelele before forming the Artistics (also known as the Autistics) with fellow students Chris Frantz and Tina Weymouth. After changing the name of the band to Talking Heads and enlisting onetime Modern Lover Jerry Harrison, the group signed to Sire Records. During a band sabbatical in 1981, Byrne teamed with Brian Eno, the producer of much of the Heads' work, for the collaborative effort My Life in the Bush of Ghosts, a complex, evocative album which fused electronic music with Third World percussion and hypnotic vocal effects. In 1988, Byrne's fascination with world music, a longtime influence on his herky-jerky performance style as well as Talking Heads' complex polyrhythms, inspired him to form his own record label, Luaka Bop, to give widespread American release to global music. That same year, the Heads released Naked, their final proper LP, leaving Byrne to give future solo work his full attention. If the staff at Waist High were to compile a "Best Albums Ever" list, the Talking Heads' Remain In Light would be on that list. It is perfect.